Ingres entered the studio of Jacques-Louis David in 1797 and became his most brilliant pupil. He was the artist who not only championed but also revitalised the classical tradition in the 19th century. History painting was Ingres’s principal aim but he was slow to achieve recognition. Although, like his teacher David, he looked down on portraiture as a lower form of art, he is arguably seen at his best in some of the greatest portraits ever painted. Ingres went to Italy in 1806 as recipient of the Prix de Rome, and worked in that city until 1820. Unable to escape from what he regarded as the artistic drudgery of portraiture, he was forced to accept it as a ready source of income to support himself and his wife, and while in Italy he made hundreds of portrait drawings. It must be said, however, that the practice of drawing was of primary importance to all his artistic endeavours. Following the fall of Napoleon in 1815, Ingres found an enthusiastic clientele among the English tourists in Rome, who had flocked back to the city liberated from French rule. One tourist after another beat a path to his door wanting their portrait drawn. 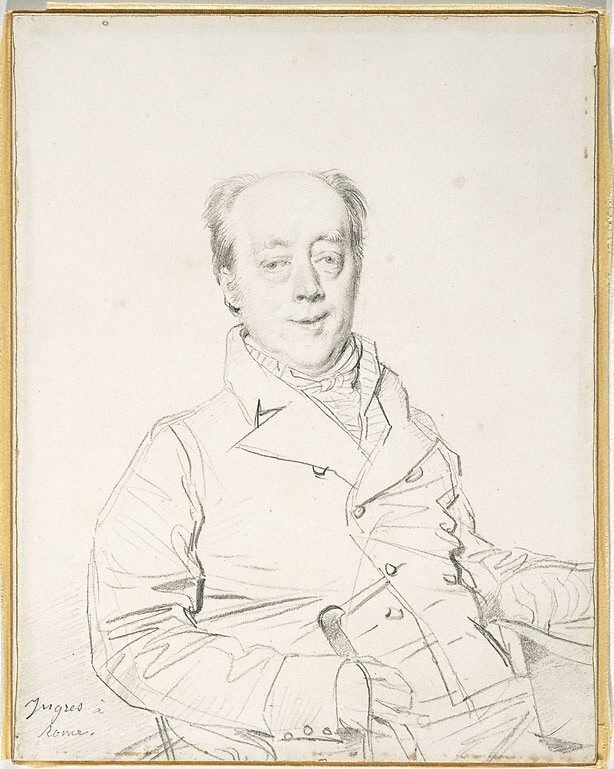 The first Englishman to sit to Ingres was Frederick North (1766–1827), 5th Earl of Guilford (and youngest son of Lord North, prime minister to George III), an engaging eccentric portrayed with a penetrating eye for his quickness of mind. A passionate philhellene and linguist, North travelled widely and lived much of his life abroad. After a stint as governor- general of Ceylon (1798–1805), he led the campaign to establish the Ionian University at Corfu, becoming its first chancellor in 1824. When North retired to London a few years later, he amused his friends by going about in academic robes, or turning up to dinner wearing the vestments of an archbishop of the Orthodox church, to which he was a convert. Evidently impressed by Ingres’s portrait, which displays a wonderfully spare but lively and descriptive pencil line, North soon introduced other members of his family to the artist: portraits of North’s sister, Lady Glenbervie, her husband, Lord Glenbervie, and their son, Frederick Sylvester North Douglas, followed. It is said that North wanted to take the artist back with him to England and set him up as a portrait draughtsman, but Ingres declined. The four pencil drawings were taken home by the English sitters, and remained in the family until the 20th century, eventually going to the writer Sacheverell Sitwell. The group was dispersed at Sitwell’s sale at Sotheby’s in 1964. The portrait of North was acquired by James Fairfax in 1965 and later given by him to the Art Gallery of New South Wales, while the remaining drawings entered private collections in the United States. The group remains intact, however, in the form of a large lithograph attributed to Ingres (AGNSW 210.2007). The print, which reproduces all four sitters on the same stone, was printed in London in 1820 or 1821, and was probably intended to illustrate Lord Glenbervie’s memoirs. Signed l.l., pencil "Ingres...". Not dated.